What was it? Jaguar? 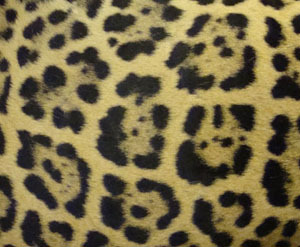 Leopard? Panther? Cheetah? Cougar? Got any idea? 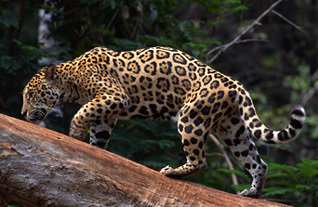 Jaguars (pictured above) live in South and Central American rainforests; A small population also lives in Arizona. They can be distinguished by their sheer size (they are the largest cat in the Western hemisphere) and also by their “rosettes” –spots within a spot – which are more prominent than on other large spotted cats. These are solitary jungle cats, preferring wet lowlands, swampy areas, and the thick cover of the rainforest. Like tigers, they enjoy swimming. They have extraordinarily strong jaws that allow them to bite through the skulls of their prey. They are known for their stealthy ambush attacks. If a jaguar is going to attack Carlos, then here’s how that’s going to work. It will be early morning or near sunset. The cat will have heard the men and would have silently crept up on them from the cover of the jungle. She’d wait until they passed and then, as the last man (poor Carlos) went by, she’d pounce in a flash, taking him down with claws, teeth, and her body weight. After a quick death bite to the head, she’d carry him off into the jungle with little difficulty. Although smaller, leopards are very similar to jaguars, except for one important thing: where they live. Leopards used to roam much of Asia and Africa, but today are found chiefly in sub-Saharan Africa, with a few fragmented populations remaining in southern India, Sri Lanka, Malaysia, Indonesia and China. 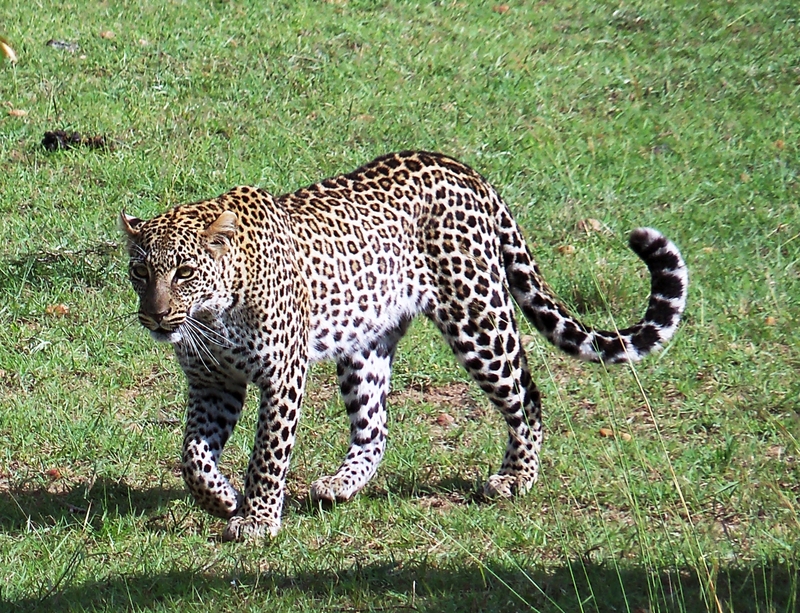 Leopards have relatively short legs and a long body. They are also comfortable in the water but are better known for their ability to climb trees. They prefer dense cover and forest river regions, but are very adaptable and can live in almost any environment. 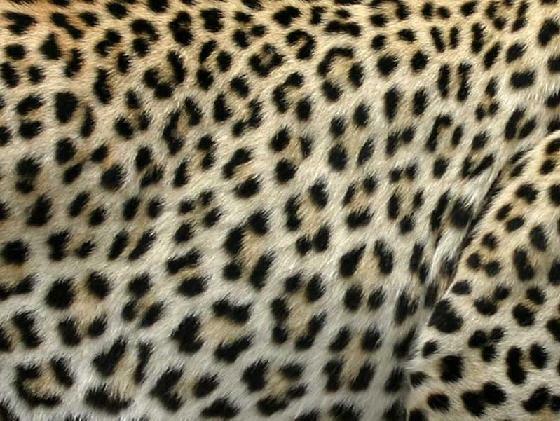 A leopard’s spots, also rosettes, don’t show the inner spots as prominently as the jaguar’s. If a leopard is to eat Carlos, your story is going to have to move to the Indian subcontinent or sub-Saharan Africa. If the men are in Africa on the open savanna, the leopard will stalk them at night, appearing suddenly out of the darkness with a great leap. In the forests of India, the leopard will be out during the day and will probably attack from an overhead tree branch. In either case, poor Carlos will again be killed by a bite to the head, but this time he’ll probably be carried up into a tree where the leopard can enjoy a leisurely meal. Most people do recognize cheetahs, but I include them here as the third big spotted cat than can be confusing. 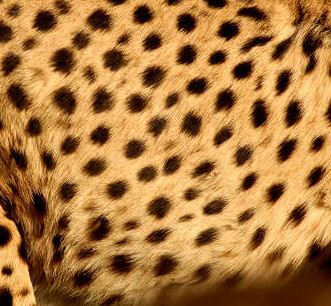 The vast majority of cheetahs are found in Africa, but a few small populations exist in Iran and Pakistan. Because cheetahs kill by running down their prey, they live in open grasslands. They are not very adaptable so don’t do well in other environments. 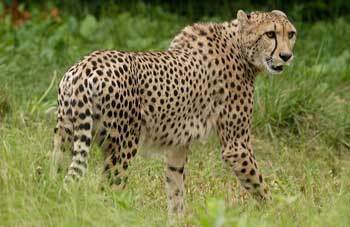 Cheetahs are long-legged and lean-bodied, like a greyhound or race horse. Their spots are solid, rather than rosettes. ground until it thinks it’s close enough to catch Carlos with a quick sprint. (It has no idea how slow Carlos’s reaction will be compared to say, a springbok). The cheetah will probably be at a full run before Carlos knows it’s coming. The man probably won’t get more than a few steps before the animal will knock him to the ground with a swipe of a paw and deliver a deadly bite to his neck. The cheetah will eat Carlos quickly, before the hyenas, lions, leopards and vultures show up and steal its food. They are timid creatures and are easily driven off their kills. It should be noted that, in my brief research, I couldn’t find any cases (except one where the cheetah had rabies) of wild cheetahs attacking humans. A number of attacks occurred in petting areas of game reserves and animal parks, but none in the wild. 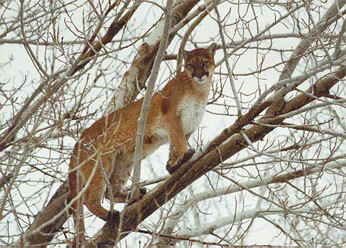 The cougar is the cat of many names: puma, mountain lion, mountain cat, catamount and panther are just a few. Cougars are tawny wildcats of that were always dragging off cattle and pouncing on unaware cowboys from craggy rocks in TV westerns, behaviors that typically resulted in the cat being tracked and shot dead. The cougar is supremely adaptable and thrives in almost every habitat — lowlands, plains, forest, mountains, or even desert, as long as there is some cover. They prefer rocky canyons, escarpments, and dense brush and are found widely distributed across western North, Central or South America. Some subspecies and small populations are found in more eastern parts of the US and Canada. Cougars are generalist predators, meaning they will eat anything they can catch. They are known to attack humans. Most of their victims are children. If Carlos is to be a cougar’s dinner, he would do well to be in California where the most of the North American attacks have occurred. The cats hunt at night (although some people have been attacked during the day), so having Carlos on nighttime perimeter patrol would work well. Even in the pitch dark, the cat will see Carlos coming from a distance and will wait to ambush him. The attack will either come silently from the ground or from the rocks above. The cougar will kill Carlos via a bite to the back of his neck that will sever his vertebra. It will then drag him away to a protected spot to eat. Once the cat has had its fill, it will bury the remains under sticks, leaves, and other debris for a later eating. 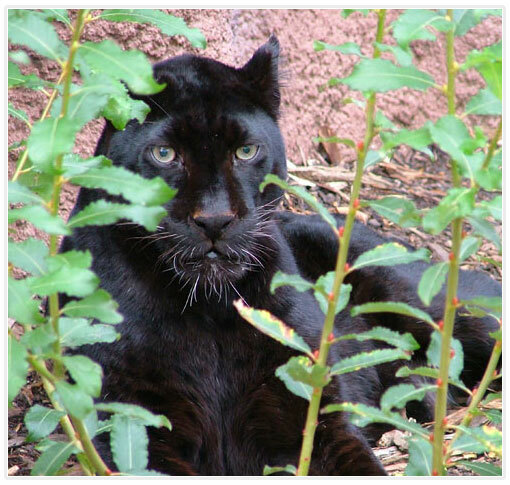 A word about panthers: Unless you’re planning to do some clarifying, don’t use the word panther in your writing. It’s a common name for several different animals and it’ll just cause confusion. On the other hand, a cougar (Puma concolor) is frequently called a panther across much of the US. In addition, the official name for one subspecies of Puma concolor, is the Florida panther. So now it’s up to you to decide whose dinner plate Carlos is going to end up on. Kim, I just love your Friday Fiction Facts. You answer the questions I didn’t even know I had in one short, entertaining blog post. Loved this instalment on big cats. Poor Carlos.